NB: This app requires a further download of 433MB of data. WiFi highly recommended as download over Cellular data could result in data charges. 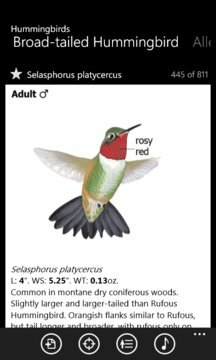 The most popular printed field guide to North American birds is now available in its entirety on Windows Phone. ● Every species is shown perched and in flight from above and below. ● Shows every major seasonal, age, and sexual variation. ● Detailed coverage of subspecies and regional variations. ● Detailed maps showing not just winter and summer range but also migration and rare occurrence. ● Detailed descriptions of songs and calls, comparing similar species measurements of length, wingspan, and weight for every species. Now all of that information is available in an easy-to-navigate portable format on any WP7.5+ device. ● Over 2300 carefully-selected and edited sound recordings. Nearly all species are represented with multiple examples showing the range of vocalizations. ● The ability to compare any two images, maps, or sounds, side by side on the screen. ● The ability to filter by state so that you see only the species likely to occur in your location. ● The ability to search by distinguishing features such as size, prominent colors, habits, and group. * Uninstalling the program will result in the loss of your list. 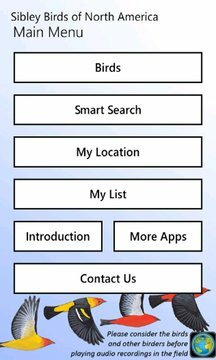 It is recommended that you backup your list prior to uninstall.